On day 2 of our NIKE/Elite Hoops Basketball Camp at Marietta High School, the emphasis was the importance of team defense and communication. Team defense is dependent on the ability of players to communicate with one another while also being in proper position on the court. It takes individuals working as a team to play great defense! The 3 key terms coaches emphasized were "ball, help, and deny." 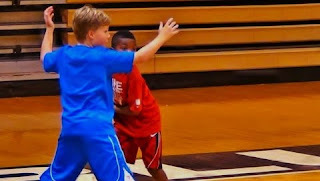 Players were taught that when guarding the basketball they should say "ball." This lets fellow teammates know where the ball is at on the court. Players who are one pass away, should have a hand in the passing lane and should be saying "deny." Finally, players who are more than 1 pass away should be in help-side defense, and should be ready to help out a teammate that has been beat by the offensive player they were guarding. Although this concept was new to some, players did their best to try to use the things they learned at the team defense station in their 5 on 5 and 3 on 3 games, and the defense definitely improved! 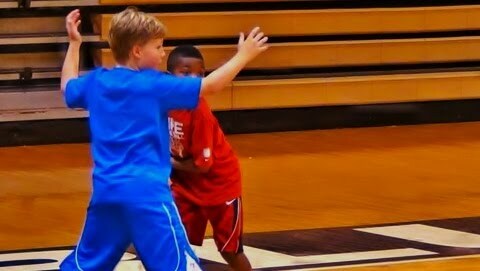 Below is a video of some of our NBA Players working hard and communicating at Coach Montepare's Team Defense Stations.